Currently I am working on a project that includes visualisation of information and knowledge, respectively. Visualisations can help to clarify information, to compress large amounts of information, to transfer knowledge, to trigger insights in the viewer, and to support the creation of new knowledge by stimulating imaginary. So visualisations influence most of the traditional building blocks of knowledge management. More than text, visualization can also provoke emotional reactions, both positively (improving our understanding) and negatively (manipulating and distortion), thereby motivating the viewer to contribute and/or create. Knowledge visualization, in contrast to information visualization, not only displays data or facts, but also its context. By enriching the content of visualizations with context, broader questions can be answered. They include questions of orientation (where are we, where do we want to go? ), assessments (how well are we doing?) and planning (how can we develop?). What type of knowledge is visualized? For whom is the knowledge visualized? When/where (in which context) should the knowledge be visualized? Why should this knowledge be visualized? Knowledge is present in many forms. It includes a clear diagram, how-tos or rules, a vague idea, papers or databases, a mind map, or a knowledge source. Clearly, those types of knowledge cannot be presented in the same form. Similarly, knowledge also cannot be presented in the same form to young students than to CEOs than to a mass audience. It is obvious that presentation of knowledge should be different on a billboard than in an internal magazine than on a public website. And knowledge for learning may need another representation than knowledge for finding or evaluation. All those different factors have to be considered when choosing how the knowledge should be visualized. Heuristic sketches: to visualize an (unstable) idea. Can support creating new insights in groups. Examples range from sketches of Freud or Leonardo da Vinci to Mind Maps. Conceptual diagrams: to explore structural relationships. Uses standard shapes to design a schematic depiction of abstract ideas. You know what I mean. 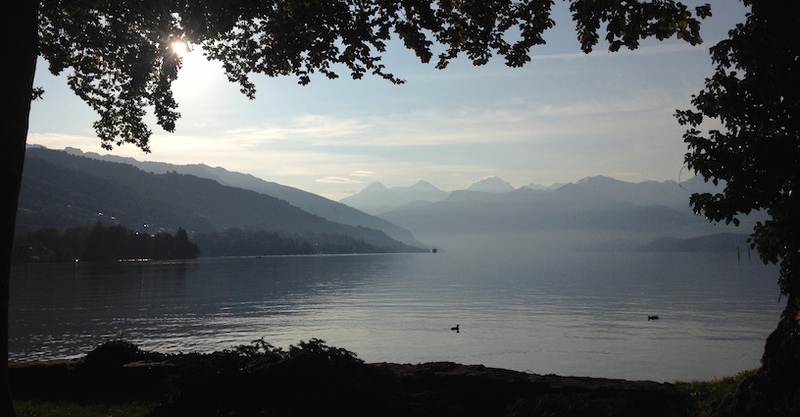 Knowledge animations: analog to visual metaphors. Can be combined with storytelling. Want to see a very nice example? How to put a framework, a study based on that framework and the studys’ results into an entertaining animation for everyone. Knowledge maps: to demonstrate locations, relationships, and quantities and qualities of elements by grouping them on a basic structure that provides the context for the elements. Elements for a knowledge map can include, but are not limited to, knowledge artifacts like white papers, articles, patents, webpages, applications; experiences and insights like lessons learned, debriefings, stories; or knowledge sources like experts, project teams, CoPs. The underlying basic structure – a landscape, a map, a graphic structure, a visual metaphor- is the common ground for the elements. It puts them into a context, provides a common language, and leads to a mutual understanding among the viewers. Only with this basic structure providing the context for the elements it is possible to visualize their locations, to build relationship or find paths among them, to display the quantity or quality of grouped elements, or to answer the questions of orientation, assessment, or development. Depending on the elements to be included and the questions to be asked, there are several kinds of knowledge maps to be chosen from. Often, the resulting knowledge maps cannot be simply put into one of those categories, but they help to start designing the map. 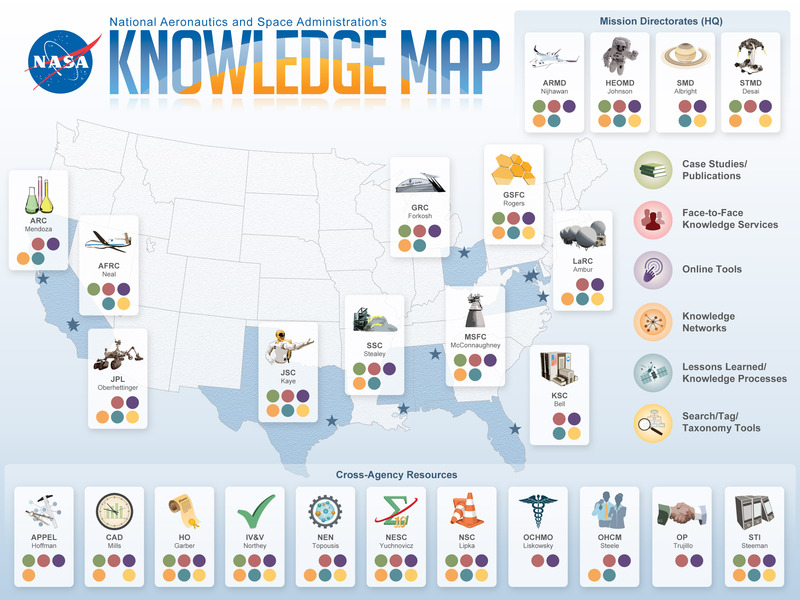 A knowledge source map of NASA-in which NASA center to find which expertise. The online version is more detailed and interactive. A knowledge assets map published in PNAS. The authors of the article Mapping topics and topic bursts in PNAS were wondering which were the “hot topics” and emergent research areas in biology. 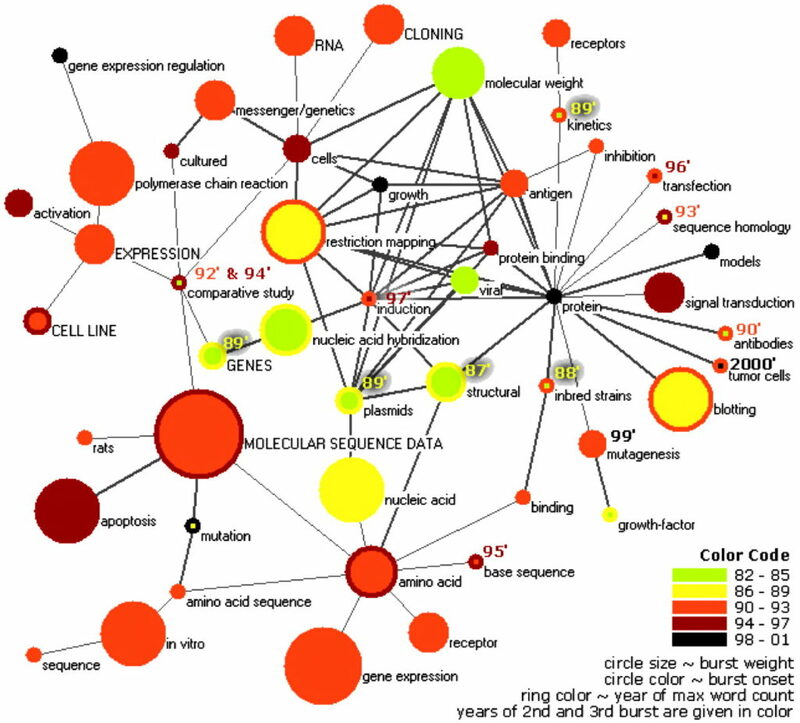 They therefore analyzed and mapped the complete set of papers published in PNAS in the years 1982-2001 in order to identify the major research areas covered by PNAS in these years, and visualised it. 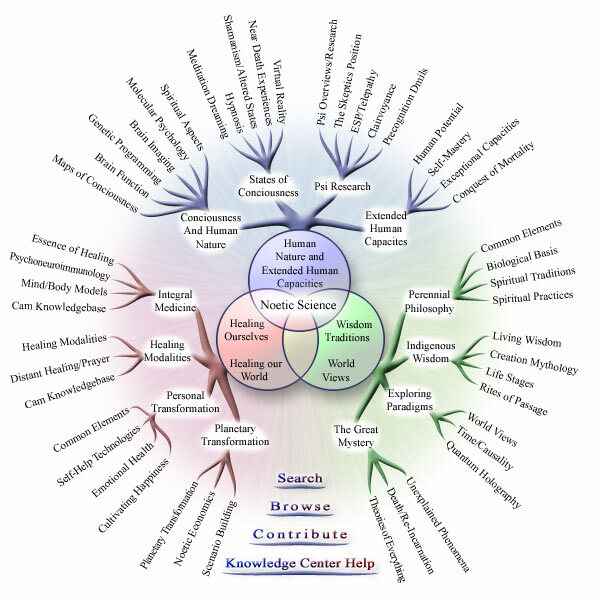 A knowledge structure map from knowledgecenter.com, which deals with Noetic Sciences- check out yourself what this means. Anyway, the map is a nice representation of a structure map. And last but not least- a knowledge development map, created to visualise the many educational units some employees of a big national company have to go through to get a particular specialisation in their area. In times of bubbles and filters, manipulation is a hot topic too. But actually it always was. A knowledge structure map serving cartographic propaganda from 1910. 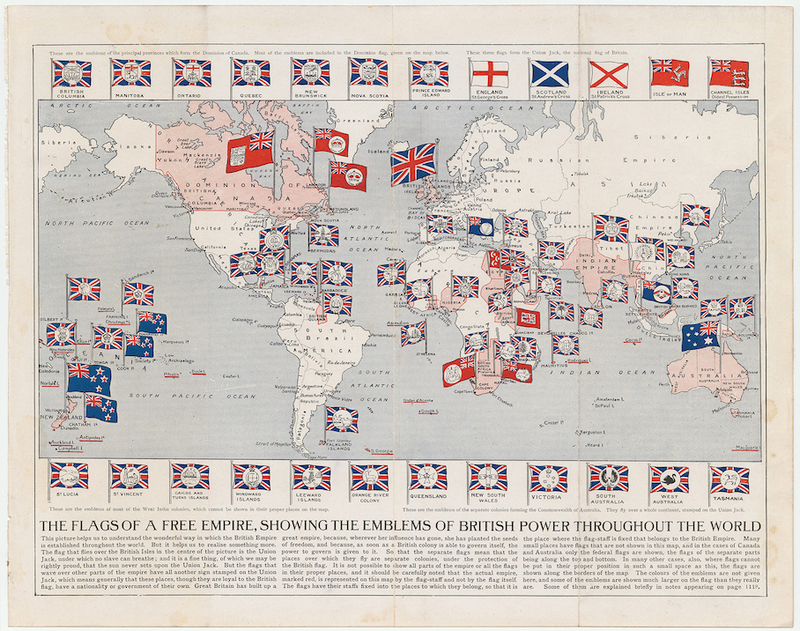 The British flags are oversized to exaggerate the power of the Empire. Do you know other good examples of knowledge visualisations? Please share!